Cranberry Salsa Dip – creamy, sweet, tangy, and a little spicy. It’s the perfect holiday appetizer or snack and is always a hit at parties. The local farm down the street from our house makes the most amazing cranberry salsa. I’ve been buying it for years. Once, about 3 years ago, they had samples of the salsa mixed with cream cheese and served up with tortilla chips. It was AMAZING! I made it for several parties that year – buying the salsa from the farm and mixing it with store bought cream cheese – and everyone loved it. This year I had such a taste for this creamy tangy combination, but I knew I didn’t want to buy the vegan cream cheese from the store so I decided to make my own from start to finish. It turned out great. A little sweet, a lot tangy, very creamy. Perfection. This homemade version was a hit with others as well and it’s going to be a keeper for all of my holidays parties for years to come. First you make the cranberry salsa, which is super easy and quick to do. Everything comes together in a food processor in just minutes. If you like things on the spicy side, you can leave the ribs and seeds of the jalapeño in or add a second one. For my palate, and my kids, one with seeds and ribs removed, is just right. This salsa has a lot of the same components of traditional salsa, but of course with cranberries instead of tomatoes. Next step is to make the dairy free cream cheese. It’s quick and easy as well, but you do need to plan ahead to soak your cashews. I made this cream cheese very basic because I knew I would be mixing it with the cranberry salsa. If you’re looking for an amazing stand alone cream cheese, check out my dairy free Veggie Cream Cheese Spread that uses this simple recipe as the base. 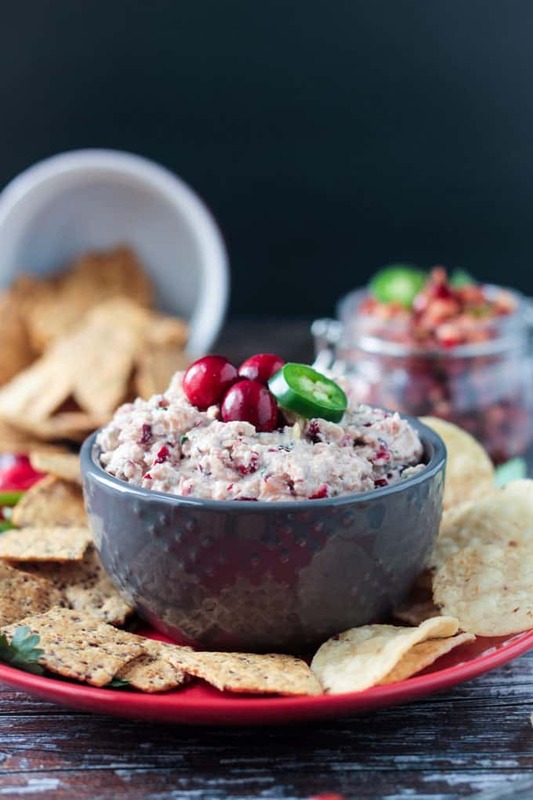 All you have to do to finish this Creamy Cranberry Salsa Dip is to mix the dairy free cream cheese and the cranberry salsa together. I generally use the full amount of both, but you can use less cream cheese if you want the cranberry salsa to stand out on its own more. 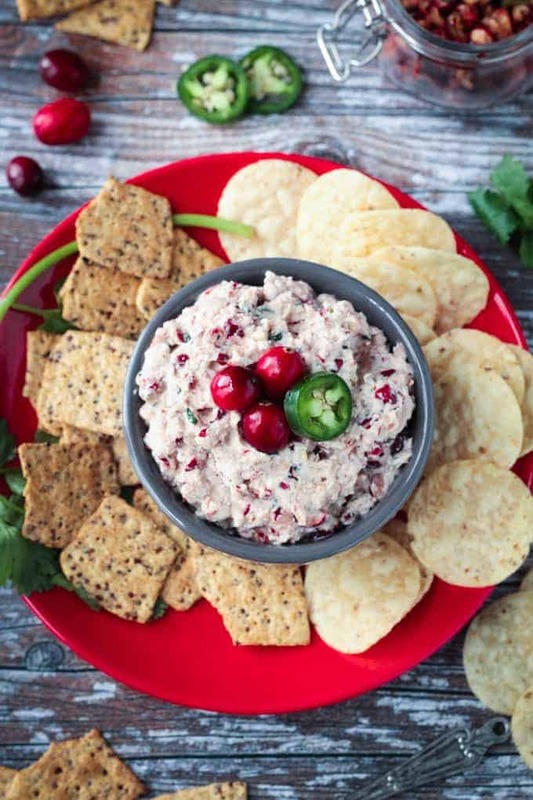 I love using tortilla chips to dip into this creamy cranberry dip, but any kind of cracker would work, as well as, fresh cut vegetables. Whatever you pair it with, it will make a beautiful holiday or party appetizer dip. I’m telling you – your friends and family will go crazy for this stuff! 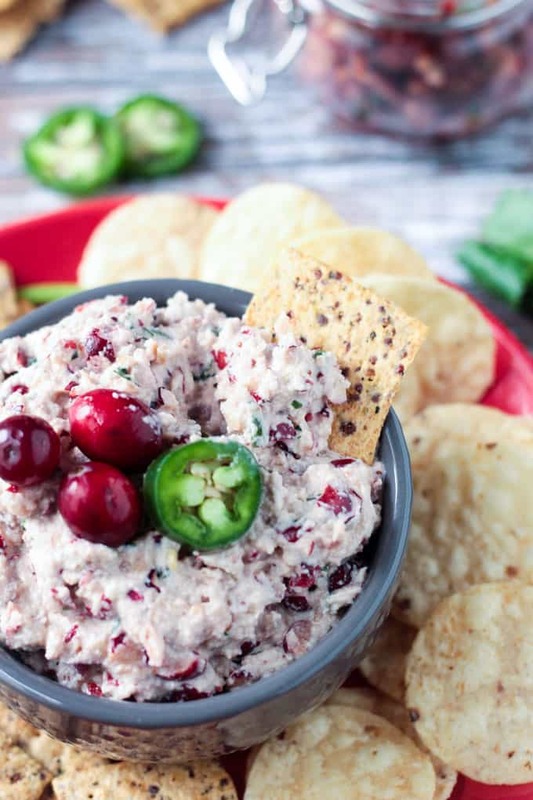 I hope you all love this Creamy Cranberry Salsa Dip as much as we do. Take it to your next holiday party and watch it disappear. Please come back and leave me a comment below with your feedback and star rating letting me know how you enjoyed it. You can find me on social media as well. Be sure to tag @veggie_inspired and #veggieinspired so I’m sure to see it. 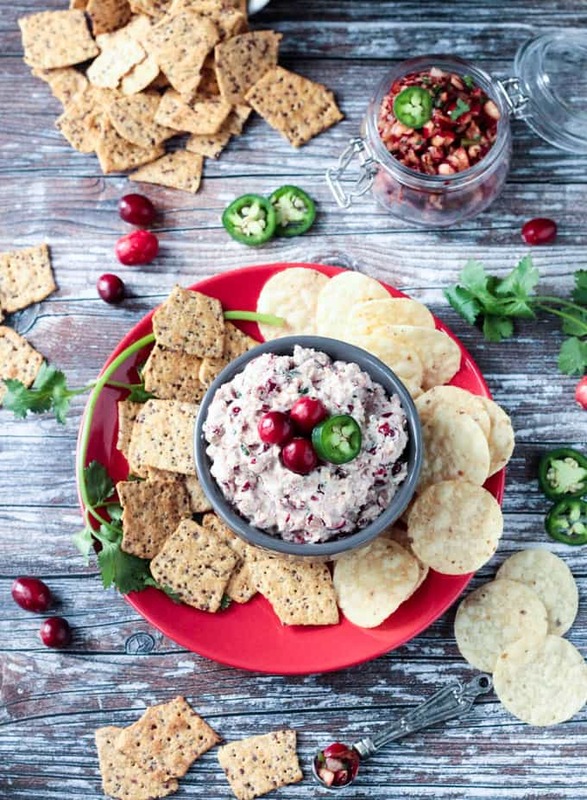 A slightly sweet, mostly tangy, creamy cranberry salsa dip. It's perfect paired with tortilla chips. 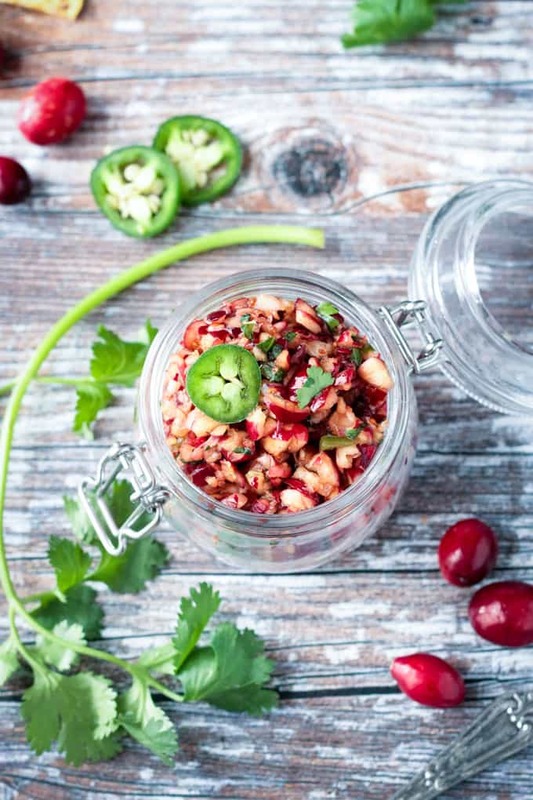 Place all ingredients for cranberry salsa in a food processor and pulse until combined. Don't over process or you will end up with a puree. You want it to be slightly chunky still. Pour into a medium bowl and refrigerate. Place all ingredients for the cashew cream cheese, except the water, into the food processor (just rinse it out after the salsa). Puree until smooth. Add the 1-2 tbsp of water, if needed, to thin it out. Mix the cranberry salsa with the cashew cream cheese until combined. Refrigerate at least 30 minutes or until serving. **The pictures on this post were updated on 11/7/17. The original recipe stands. I was amazed by the cashew cream cheese and totally thrilled that I can have plant-based cream cheese. And the cranberry salsa with it is incredible. The whole famy loves it. That’s awesome, Abo! So glad everyone loves it! Happy holidays! Tracie – I somehow missed this comment before. I’m thrilled you loved it so much! Thank you so much for your feedback. Happy New Year!! Yay! Glad you are liking it so far. I’m making some today too! Let me know how it all comes together! Happy Holidays! Totally making this for Thanksgiving! 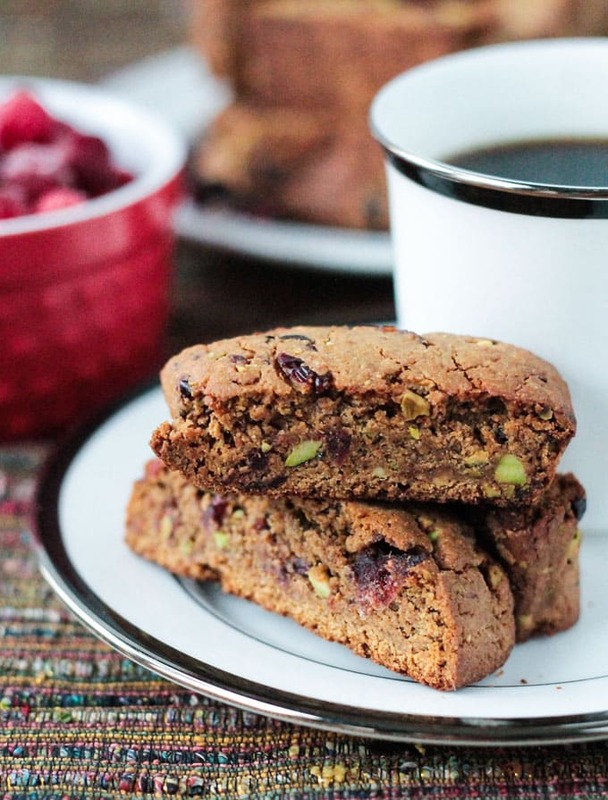 I love cranberry recipes, so this would be completely perfect! Mmmm, yummy cashew cream cheese again! I can never get enough of that. This looks so deliciously fresh Jenn. What a creative and delicious dish! This really looks incredible. 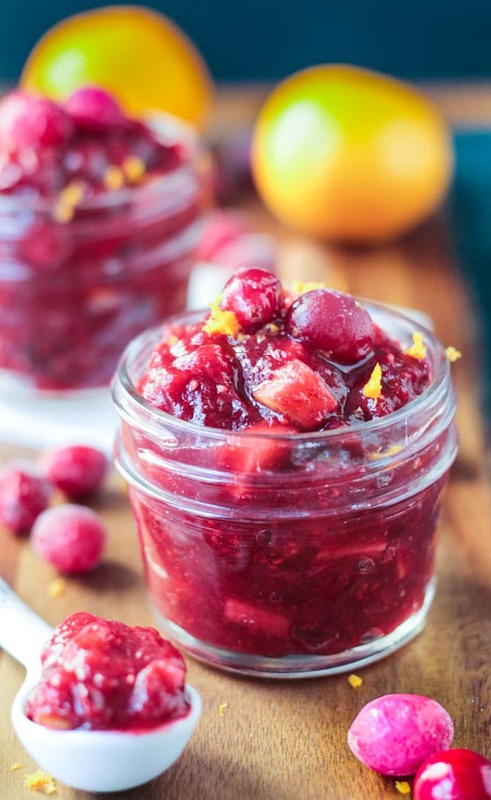 Such a fun and unique use of cranberries. I can totally see how this would be a big hit at parties! It looks amazing! And so festive! I made this this weekend and it was really good! I think it was best the day it was made as by the second day it was very watered down. 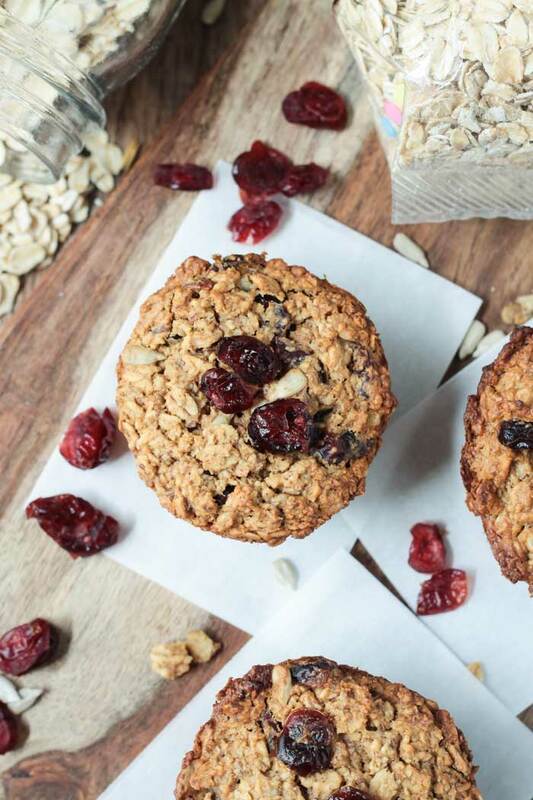 Thanks for sharing this tasty recipe! Hi, Michelle. Thank you! So glad you liked it! I find you just need to give it a good stir on the second day and it all comes back together. This looks delicious! I’m making for Thanksgiving so I wondered how long it will keep in the fridge? I want to make as much as possible ahead of time. Hi, Christine. I will keep for a couple days at least. You’ll probably need to stir it again before serving as some of the liquid will accumulate in the bottom of the bowl. Enjoy! Happy Thanksgiving! Delicious! I dared to put in two small, seeded jalapeños and after taste-testing the salsa, I regretted putting in both. Luckily, after I combined the two parts, it was just right! I plan to have this while watching the debate results tonight. Thanks for the recipe! I mean election results. D’Oh! THIS. LOOKS. AMAZING. I can’t wait to try it!!! Thank you, Beth! I hope you enjoy it! This was such a hit with my family last year! Love it! It makes me so happy that you guys loved it! I take it to almost every holiday party and it’s always a hit! Thanks, Sarah! My husband and my parents both loved this! We ate it with chips, but my favorite was celery. This was the first time I’very made cream cheese, but it will not be the last. I am taking this to the big family Christmas party, where there will be lots of non-plant based eaters…hoping they will like it! I am so excited to hear this, Sara!! I’m so happy everyone loved it! It’s the perfect festive party dip. You’ll have to come back and let me know what everyone else thought too! Happy Holidays!! Looks so festive and gorgeous! 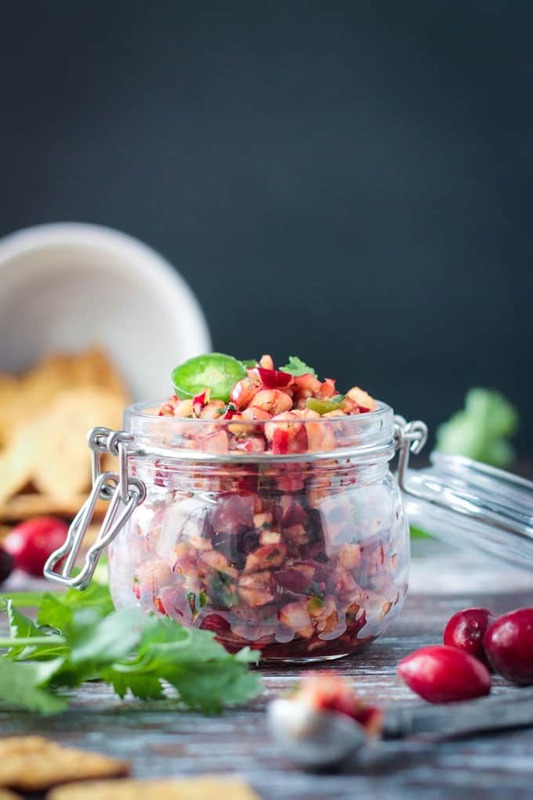 Love the cranberry salsa, what a wonderful idea, especially with the homemade! I never buy storebought cream cheese, it’s just not as good as homemade. I’m planning on making my strawberry cream cheese for the weekend, it’s a really intense strawberry flavor, better than the dairy I use to have! I’m drooling at the sound of that salsa! This looks like the perfect festive dip to serve at holiday parties! It’s always a hit! Thanks, Dianne! This looks so good and so festive! Thanks, Becky! Very festive and so so good!